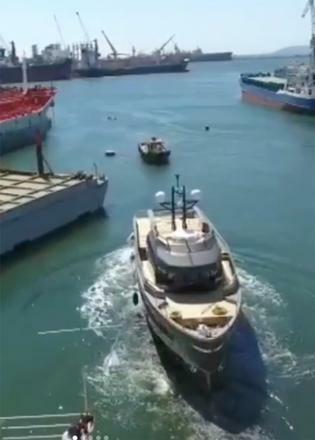 Turkish yard Evadne Yachts has released a behind-the-scenes video of the 24 metre explorer yacht Rock after delivering the yacht last month. 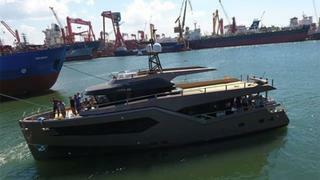 The yacht, which will appear at the Cannes and Monaco yacht shows, was launched on August 4. Rock was designed by Dutch design and naval architecture studio Vripack. Described as an 'SUV yacht', she was built from a steel hull and aluminium superstructure and project managed by Tufan and Bros. Designer Robin De Vries revealed that marble is one of the key materials on board, with the masculinity of the stone creating a sense of balance with the feminine exterior lines. Accommodation is for eight guests split between four cabins, including an owner’s cabin, a VIP suite and two twin rooms, while the crew quarters allows for a staff of up to four people. 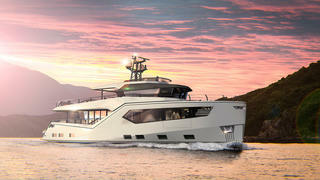 Power comes from a pair of 1,000hp Caterpillar C12 diesel engines for a top speed of 17 knots. 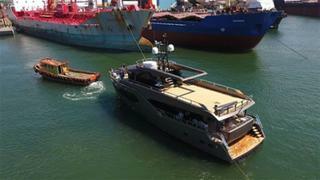 When trimmed back to her cruising speed of nine knots, Rock will boast a maximum range of 3,500 nautical miles thanks to a total fuel capacity of 12,000 litres.